1953 was the first year of the F100 and the last year you could get a Flathead in a Ford pickup. The new 53 F100 was uniquely styled with a slant cab window, fat fenders and larger cab space than the F1. 1953 was also the 50th anniversary of the Ford pickup. The horn button on the 53 F100 is unique and displays the anniversary year. Differences were minor when compared with today’s truck options. A fresh air cab option on the 53 F100 was available. Deluxe 53 F100 trucks had 6 chrome teeth mounted in the grille – 3 on each side of the center chrome emblem. Deluxe trucks also had a chrome gull wing on each side of the hood surrounding the chrome 53 F100 emblem. Turn signals were not standard equipment. Seat belts were also not available. Vacuum wipers were used and only worked when you let off of the gas to free up vacuum from the engine to run the wipers. Front suspension was a straight axle with leaf springs. Brakes consisted of a single master cylinder with drum brakes on all 4 corners. These are fine for speeds below 45, but hardly safe on today’s roads. 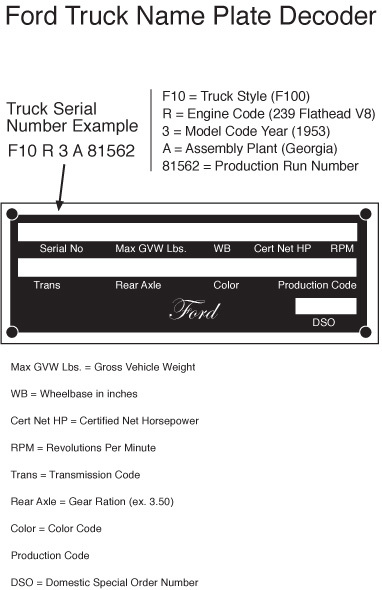 Most parts on the 53 – 55 F100 trucks are the same or will fit. These years are basically the same except for trim and engine options. The grille on the 53 F100 is unique to that year. 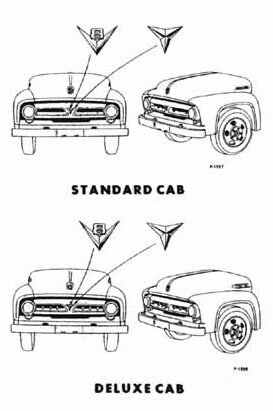 Front parking lights are the same on 53 and 54 F100 models, as well as the lower valance that runs below the grille. Gull wing chrome and the F100 hood emblems are the same on 53 and 54 F100 trucks. Taillights were also the same on 53 and 54 models and were the round version rather than the shield shape lights found on the 55 and 56.